The Town of Saratoga NY lies in the foothills of the southern Adirondack Mountain region of Upstate New York. The town is comprised of many hamlets, coves, cities and villages including Schuylerville, Saratoga Lake, and Saratoga Springs. Great shopping, superb dining, exciting nightlife, fun events and wonderful spas! Whether its horse racing, history, the arts or the Adirondacks, you'll find it in Saratoga. Also know asSaratoga Racetrackor "the flat track", Saratoga Race Course is the oldest continually operating Thoroughbred horse racing track in the United States. The track is home to theTravers Stakes, "America's Mid-Summer Derby" which occurs in late August. Referred to locals and frequent visitors as "SPAC", this outdoor performing arts venue features classical performances, the Saratoga Jazz Festival, theSaratoga Wine and Food Festivaland major pop and rock concerts. It is the summer home of the New York City Ballet and The Philadelphia Orchestra. With over 1,000 video gaming machines, harness racing and a night club,Saratoga Casino and Racewayhas plenty going on. Just be sure to bring your good luck charms! Known as the Turning Point of the Revolutionary War, theBattle of Saratogahappened here. Learn more at a comprehensive Visitor Center or take a ride around the tour road. With over 2,000 pristine acres of park, Saratoga Spa State Park has to be at the top of an outdoor lover's list of things to do while visiting Saratoga. The park features mineral springs, reflecting pools, an automobile museum, a hotel, a spa, a golf course and more. Visitors will find some of the best golf value in the Northeast in Saratoga. From Saratoga National Golf Club, one of the top 100 public courses in the country according to Golf Digest, to award-winning Airway Meadows, you're sure to find the perfect place to tee off. With over 10 museums, including three national museums, history is alive here. Check out the National Museum of Racing, the National Bottle Museum or the National Museum of Dance. You can also visitmuseumsthat feature art, automobiles, local history and more. With 18 naturally occurring mineral springs in Saratoga, you can "take the cure" as visitors did during the Victorian age. The first major attractions in Saratoga, these springs still flow throughout the area. Saratoga was known as the "Queen of the Spas" for many years. Today, visitors can still enjoy natural mineral baths from the bubbling springs below or more modern treatments at several local spas. Enjoy action-packed polo at Saratoga Polo's Whitney Field, one of the most historic Polo fields in the United States. This exciting venue features dining and entertainment options as well. Daisy Dry Goods- Antique and vintage items. FortyCaroline Antiques- Located in the "Downstreet Marketplace"
Stone Soup Antiques Gallery- Premier Antiques Marketplace. Alpine Sport Shop- Specializing in Warm winter clothing and gear. Malika International- Hand crafted fine gifts. Something Bleu Bridal/Bird of Paradise Boutique- Dressing women in unique dresses for 25 years! Spoken Boutique- A unique specialty clothing store. Saratoga Flag Co.- Custom flags & signs. Posie Peddler- A local favorite! Minogue's Beverage Center- Large selection of Beer, soft drinks, and more. Crafters Gallery- A local favorite! Frank Adams Jewelers- Providing incomparable selection and service. G. Willikers- Imaginative and educational toys for all ages! Lakeside Farm Cider Mill- Enjoy breakfast and lunch or cider and doughnuts. PJ's Saratoga Style Bar-B-Q- We make eating a picnic! Seven Horse Pub- Enjoy great food in a building full of character! Uncommon Grounds Coffee & Bagels- Specializing in coffee, bagels and desserts. Catherine's In the Park- Catherine's - Historic, poolside elegance. Century House, A Clarion Hotel- Where our house feels like home. Circus Cafe- A fun and festive dining sensation! Fifty South Bar & Restaurant- A dinner with a twist. Grey Gelding Bistro- A wine and food lover's paradise. The Irish Times Pub & Restaurant- Relax in a true Irish atmosphere! Jacob & Anthony's American Grille- American fare with modern twist! Sabina's Woodfire Restaurant- Saratoga's Best Wood Fired Pizza! Scallions- Fresh, innovative fare, take-out available. Uno Chicago Grill- Great deep dish pizza plus casual dining menu. Village Pizzeria & Ristorante- A taste of Italy in the Adirondack Foothills. Wings Over Saratoga- Fresh, made to order wings & boneless wings. Ravenous- Wide selection of savory and sweet crepes. The Inn at Saratoga- Classic Victorian setting. Siro's- Top entertainment and world class dining! Sperry's- A Saratoga Tradition since 1932. Ben & Jerry's Ice Cream & Frozen Yogurt- Ice cream, frozen yogurt, sorbet, cakes and more! Chianti Il Ristorante- Authentic Italian restaurant. Forno Bistro- Offers a variety of Tuscan style Italian food. Mama Mia's Pizza and Cafe- Homemade, hand tossed brick oven gourmet pizza. Sushi Thai Garden- We serve the finest Thai cuisine. Gracious accomodations and hosts await you at the bed and breakfasts in Saratoga. From Victorian to modern, you're sure to have delightful stay and meal. Enjoy the great outdoors at our area campgrounds and RV resorts. Saratoga has a wonderful selection of hotels to choose from. From full-service luxury properties to your favorite chain hotels, Saratoga hospitality awaits you. Saratoga has many moderately priced motel properties throughout the area. You'll find a wide selection of rental properties available through our member realtors and rental specialists. In addition to the Saratoga Race Course, there are other popular activities that the entire family will enjoy. Saratoga can truly be called a city of parks and gardens. To enjoy the natural beauty of the region visit Yaddo, Congress Park, Saratoga State Park, and Saratoga Lake. No matter the weather or the season outside, sometimes it's nice to take a break from the outdoors and enjoy family fun indoors. Saratoga County has a great selection of amusement centers, libraries, museums and other places for indoor fun. See a great show; enjoy live musical performances, an organ recital or a play. You'll find all of this in more in Saratoga. Saratoga is home to several national museums. The National Museum of Racing and Hall of Fame , the National Museum of Dance. and the National Bottle Museum. Kids of all ages will love the hands-on exhibits at the ever-expanding Children's Museum at Saratoga. Every town has a story and Saratoga County is no exception. From Hadley to Waterford, you'll find unique treasures and great spots anywhere you visit. Enjoy the excitement of Thoroughbred horse racing at America's oldest continually operating track, Saratoga Race Course or head to Saratoga Gaming and Raceway for action-packed harness racing. Saratoga...a golfer's paradise with award-winning courses located in the summer place to be! Our courses are unique and will challenge the very best golfers. Saratoga boasts some of the best golf value in the Northeast. Enjoy a day on the farm in Saratoga. From apple picking to corn mazes, you'll find things to do for children of all ages here. Explore corn mazes, fairs and farmer's markets during your visit to Saratoga. There are many opportunities to get out on the farm for some good old fashioned fun. Take a ride on the Visitor Trolley, discover secrets of the past, or learn the history of the Battle of Saratoga. The Saratoga County Chamber of Commerce Operates an information center from late June through Labor Day. It is open seven days a week and the friendly staff will be happy to help you with last minute accommodations, as well other information you may need during your stay. The Saratoga County Chamber of Commerce event calendar is updated frequently and includes detailed information on events happening across Saratoga County. The Saratoga County Chamber of Commerce offers many networking events and educational seminars. For centuries, Saratoga County has been a premier summer destination. Truly a place for all seasons, join us as we return to the Victorian age during the magical Saratoga winter season. Click here for a list of annual events in Saratoga County. Fort Saratoga was built in 1691 on the west bank of the Hudson River about a mile south of the current village ofSchuylerville, New York, which was settled shortly thereafter, and was known as Saratoga until 1831. In 1767,Sir William Johnson, British soldier and a hero of theFrench and Indian Wars, was brought about ten miles (16 km) west of the village, to what would become the city of Saratoga Springs, by Native American friends, to treat war wounds at a spring thought to have medicinal properties. The spring is now known as High Rock Spring, and may be visited today. The first permanent settler at the springs arrived around 1776, and a tourist trade swiftly grew, with hotels being constructed starting withGideon Putnam. Putnam laid out the roads and donated land for use as public spaces. Saratoga Springs was established as a town in 1819 from a western portion of theTown of Saratoga. Its principal community was incorporated as a village in 1826 and the entire region became a city in 1915. In the 19th century, the noted doctorSimon Baruchencouraged bringing European style spas to the United States, and thus Saratoga Springs, with its wealth of mineral waters developed as aspa, seeing many hotels built, including theGrand Union Hotelthat was, in its day, the largest hotel in the world,and the United States Hotel. In 1863,Saratoga Race Courseopened and moved to its current location the following year, greatly expanding the city's reputation as a tourist destination. In addition, the Saratoga Springs area was known for its gambling, which after the first years of the 20th century was illegal, but still widespread. Most gambling facilities were located on Saratoga Lake, on the southeast side of the city. After the closing and demolition of many of the town's premier hotels, including the Grand Union and United States, in the 1940s and 1950s, Saratoga Springs experienced a significant economic downturn. During the 1950s, the famed gambling houses were also shut down, which hurt Saratoga Springs' popularity even more. The city's rebirth began in the 1960s with the completion of the Adirondack Northway (Interstate 87), which allowed visitors from the New York City area much easier access. In addition, the construction of the Saratoga Performing Arts Center in the late 1960s, which features classical and popular music and dance, furthered the city's renaissance. TheBattle of Saratoga, the turning point of theRevolutionary War, did not take place in Saratoga Springs. Rather, the battlefield is 15 miles (24 km) to the southeast in the town ofStillwater. There is a museum dedicated to these two battles located on the fields where the battles were fought. The British encampment before the surrender at Saratoga took place 10 miles (16 km) east of the city, inSchuylerville, and there are several historical markers delineating points of interest. The surrender of the sword took place where Fort Saratoga had been, south of Schuylerville. Saratoga Springs is located at43°04′31″N 73°46′57″W(43.075337, -73.782422). According to theUnited States Census Bureau, the city has a total area of 29.1 square miles (75.3 km2), of which, 28.4 square miles (73.6 km2) of it is land and 0.6 square miles (1.6 km2) of it (2.17%) is water. The Adirondack Northway (Interstate 87) andUS Route 9pass alongside and through the city.New York State Route 29,New York State Route 50,New York State Route 9N, andNew York State Route 9Plead into Saratoga Springs. Saratoga Lake is southeast of the city. Saratoga Springs is a popular place for family reunions. As of thecensusof 2000, there were 26,186 people, 10,784 households, and 5,985 families residing in the city. Thepopulation densitywas 921.1 people per square mile (355.6/km2). There were 11,584 housing units at an average density of 407.5/sq mi (157.3/km2). The racial makeup of the city was 93.53%White, 3.11%African American, 0.24%Native American, 1.03%Asian, 0.03%Pacific Islander, 0.64% fromother races, and 1.41% from two or more races.HispanicorLatinoof any race were 1.85% of the population. There were 10,784 households out of which 25.3% had children under the age of 18 living with them, 43.1% weremarried couplesliving together, 9.6% had a female householder with no husband present, and 44.5% were non-families. 35.0% of all households were made up of individuals and 12.3% had someone living alone who was 65 years of age or older. The average household size was 2.21 and the average family size was 2.88. In the city the population was spread out with 19.4% under the age of 18, 15.5% from 18 to 24, 27.5% from 25 to 44, 23.4% from 45 to 64, and 14.3% who were 65 years of age or older. The median age was 36 years. For every 100 females there were 90.4 males. For every 100 females age 18 and over, there were 87.1 males. The median income for a household in the city was $45,130, and the median income for a family was $59,281. Males had a median income of $39,573 versus $29,439 for females. Theper capita incomefor the city was $26,250. About 5.5% of families and 8.8% of the population were below thepoverty line, including 10.0% of those under age 18 and 5.7% of those age 65 or over. 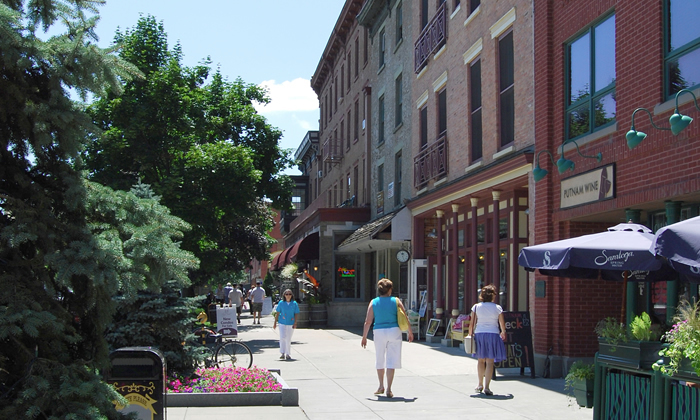 Though Saratoga Springs relies heavily on tourism as its main source of income, especially during the Summer months whileSaratoga Race Courseis open, there is plenty of industry that keeps this culture-rich city's economy booming. Saratoga Springs is home toQuad Graphics, offset printers ofTime Magazine,Newsweek,People Magazine,Sports Illustrated& many others.Ball Corp., makers of the Mason Jar as well as aluminum cans for companies such asPepsi&Anheuser-Busch InBev, has a large manufacturing plant in Saratoga County.AMD- Advanced Micro Devices, Inc. has recently opened a manufacturing site in a newly constructed office park just outside Saratoga Springs. Stewarts Shops, a popular convenience store chain that is an employee and family-owned business dealing in milk, ice cream, coffee, food to go, gasoline, and more, is based out of Saratoga Springs with a distribution center in Greenfield Center. Stewarts now has over 300 stores throughout New York & Vermont. Perhaps the most recognized of all businesses in Saratoga Springs is the Saratoga Spring Water Co. on Geyser Road. Since 1872, Americans have been enjoying this popular bottled mineral water whose blue glass bottle is still its trademark to this day. 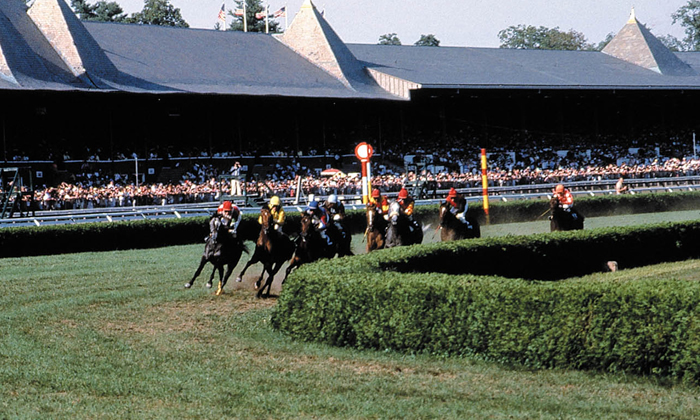 The city is perhaps best known for theSaratoga Race Coursewhich opened on August 3, 1863. The first track was located across Union Avenue from the present Saratoga Race Course, which opened the following year. Founded by John Hunter andWilliam R. Travers, thethoroughbredtrack is the oldest continuously-operating sporting event of any kind in the United States. The track holds a summer meet lasting six weeks, from late July to Labor Day, that attracts the top horses, jockeys, and trainers in America. The meet features a number of major stakes races, with the Travers Stakes, a Grade I race, being the most important of America's summer horseraces. Known as the "Summer Derby," the 2008 Travers was won by Colonel John who earlier had won the Santa Anita Derby.The track season sees a dramatic influx of people into the city. Hotels fill to capacity, and many Saratogians rent out their homes. Also located in the city is theSaratoga Gaming and Raceway, a harness (Standardbred) racetrack that includes a video gaming facility, the Racino. Before racing began in Saratoga, the area's natural mineral springs had been attracting summertime visitors for many decades. These springs were believed to have healing powers. The Lincoln Baths was one such place people would go to be treated with the waters. The bath house has since been transformed into an office building, but still exists and can be visited to this day. The spa treatments also are being continued in a new bath house in the Spa State Park called the Roosevelt Baths. Springs can be found all over town. Most of the springs are covered by small pavilions and marked by plaques; others, however, are less conspicuous, sometimes just a spigot in a rock. The springs are famous for their varied and distinct tastes: some are clear freshwater, others are saltier, and some taste strongly of a certain mineral such as sodium bicarbonate or sodium chloride. There is a sulfur odor but mineral analysis of the water consistently shows almost no presence of dissolved sulfur, because the sulfur is in the form of the gashydrogen sulfide, which degasses from the water very quickly. Visitors are welcome to bottle the spring water for personal consumption. Big Red Spring, Charlie Spring, Columbian Springs, Congress Spring, Deer Park Spring, Empire Spring, Geyser Island Spouter, Geyser Spring, Governor Spring, Hathorn #1, Hathorn #3, Hayes Well Spring, High Rock Spring, Old Iron Spring, Old Red Spring, Orenda Spring and Tufa, Deposits, Patterson Springs, Peerless Spring, Polaris Spring, State Seal. TheSaratoga Performing Arts Center(known by its acronym "SPAC," rhymes with "snack") is a covered outdoor amphitheater located on the grounds of theSaratoga Spa State Park, with a capacity of 5,000 in reserved seating and 20,000+ on its general admission lawn area. 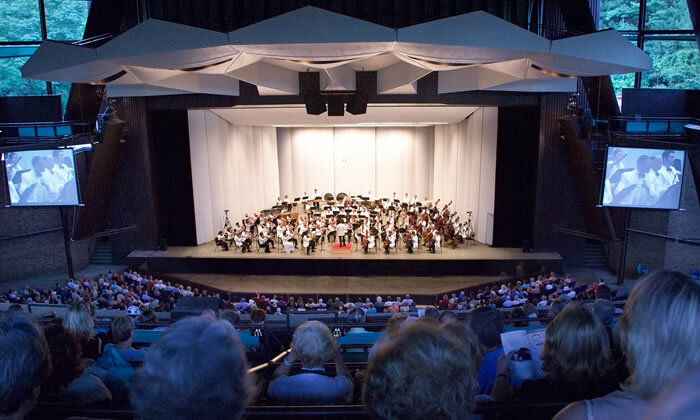 SPAC is the summer home of thePhiladelphia Orchestraand theNew York City Ballet, and has hosted a weekend-long jazz festival for several decades. 2007 marks the second year of the annual Saratoga Native American Festival held on the grounds of SPAC. It is a stop for touring national recording artists: over 20 popular bands grace the stage every summer. Steps away on State Park grounds, theSpa Little Theaterhosts the "Home Made Theater" as well asOpera Saratoga(formerly known as the Lake George Opera) during the summer. There are severalmuseumsin the area, including theNational Museum of Dance and Hall of Fame, and theNational Museum of Racing and Hall of Fame. There are more than 20golf courses. The city is also notable for its vibrant night life.Caffè Lenawas one of the first venues in the Eastern US at whichBob Dylanperformed, in 1961.Arlo Guthrieplayed the Caffè early in his career and has returned for occasional benefit concerts. SingerDon McLeanis said to have composed his "American Pie" sitting at a table in the Tin & Lint, a bar on Caroline Street. A plaque marks the table today. Numerous other establishments exist on Broadway, Caroline Street, and the redeveloped Putnam Street. Recently, Beekman Street (four blocks west of Broadway), once the center of a lower class residential neighborhood, has become an art district, housing four galleries, a restaurant, a pub and teahouse, and a bistro. Artists live and work in co-ops and arrange social events. While many congratulate themselves on "revitalizing" a "deteriorating" area, others consider such declarations an insult to the generations of Saratogians of marginalized ethnicities that toiled in support of the tourism economy of the city, and were traditionally segregated to this once-remote quarter. Saratoga Springs is also home toYaddo, a 400-acre (1.62 km2; 0.62 sq mi) artists' community, founded by the great Wall Street financier,Spencer Traskand his wife, the authorKatrina Trask. Since its inception in 1900, Yaddo has been home to 60Pulitzer Prizewinning authors and oneNobel Prizewinner.Sylvia Plath,Truman Capote, andDavid Sedarishave all been artists-in-residence. The Yaddo grounds are adjacent to the backstretch of the Saratoga Race Course. Saratoga Springs has graced the silver screen since the days ofClark Gable&Edward G. Robinson. The following is a list of movies filmed in and around Saratoga Springs. Empire State CollegeandSkidmore Collegeare both located in Saratoga Springs. During the summer, Skidmore is one of several hosts for the Johns Hopkins'Center for Talented Youth.Eastern Nazarene College, located inQuincy,Massachusetts, was founded in Saratoga Springs as the "Pentecostal Collegiate Institute and Biblical Seminary" at the turn of the 20th century. One high school (grades nine through 12th) -- Saratoga Springs High School located on Blue Streak Boulevard in the City of Saratoga Springs. Dr. Janice M. White is Superintendent of the Saratoga Springs City School District; Assistant Superintendents are Kurt Jaeger (Business), Thomas Mele (Elementary Education) and Michael Piccirillo (Secondary Education). The school Board is made up of Mia Pfitzer (President), Regina Gapczynski (Vice President), Russell Danforth, Ernest Gailor, Steve Grandin, Frank Palumbo, Charles Phillips, Jeffrey Piro, and Jay Rifenbary; school board members serve three-year terms. Private schools in Saratoga Springs includeSaratoga Central Catholic High School, St. Clement's Regional Catholic School, The Waldorf School of Saratoga Springs, and Saratoga Independent School. Saratoga information courtesy of the Saratoga County Chamber of Commerce and wikipedia.org.